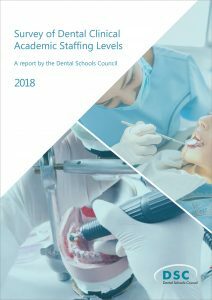 Figures published today by the Dental Schools Council confirm the highest ever number of clinical academics employed by UK dental schools, to a total of 592 full-time equivalent (FTE) clinical academics, and a headcount of 990. Of these, there were 383 FTE Professors, Senior Lecturers and Lecturers and 291 FTE Senior Clinical Teachers, Clinical Teachers and Researchers. There have been year-by-year increases in the number of Senior Clinical Teachers and Clinical Teachers, since the role was recognised as a clinical academic pathway with an emphasis on teaching rather than research. This accounts for nearly 90% of the expansion of the clinical academic team from 471 FTE in 2007 to 592 FTE in 2014 (+24%). Just 14% of Senior Clinical Teachers, Clinical Teachers and Researchers hold full-time contracts with the university, compared with 85% of Professors, Readers/ Senior Lecturers and Lecturers. There is however a second trend in the profile of academic dentistry, in that those on research-focused clinical academic pathways are increasingly top heavy. The number of Professors has increased steadily to its highest level of 118 FTE in 2014, and 79% of Professors and Readers/ Senior Lecturers are now aged 46 and over. The rise in the proportion of women entrants to UK dental schools is beginning to change the number of women dental clinical academics. There is near gender parity at Clinical Lecturer and Clinical Teacher roles, and 40% women overall, up from 32% ten years ago. Just 18% of Professors are women, however, and whilst this reflects an improvement on 11% on 2004, change at the top of academic dentistry is more gradual. Just 22% of the clinical academic team is of BME origin, compared with 44% of the dental student population. ‘It is excellent news for UK healthcare that we have more clinical academic dentists than ever before. These are the people who can guide research through direct experience with patients while training the next generation of dentists. This is helped greatly by the expertise among clinical academics being so well developed across the specialties. ‘However, there is a risk that the pipeline of early career research-active clinical academic dentists is not sufficient to replace the potential loss of expertise at the top. Long-term planning is required to address this, as well as effective promotion to young dentists of the unique value of becoming a clinical academic. This is the 13th data update to be published by the Dental Schools Council since 2000. 18 dental schools returned data on clinical academic grade, specialty, percentage full-time, source of funding, age, gender and ethnicity for each individual in post as at 31 July 2014. The Dental Schools Council is the authoritative voice of the Heads and Deans of the University Dental Schools across the United Kingdom. The Council is currently chaired by Professor Callum Youngson, Head of School of Dentistry, University of Liverpool. Its Chief Executive is Dr Katie Petty-Saphon. The Dental Schools Council website is undergoing redesign. For more information on this press release, and on the work of DSC, please contact Edward Knight on 020 7419 5427 or edward.knight@medschools.ac.uk.